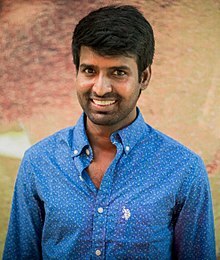 Soori is an Indian film actor and comedian who appears in Tamil films. He rose to fame after his role in the film Vennila Kabadi Kuzhu (2009), in which the scene involving a parotta eating challenge earned him the nickname Parotta Soori. 2017 Si3 Veera Babu "Veeram"
^ Parotta Suri Makes The Leap To The Next Level - Parotta Suri - Sundarapandian - Vennila Kabadi Kuzhu - Tamil Movie News. Behindwoods.com (18 December 2012). Retrieved on 4 January 2014. ^ Gupta, Rinku. (19 August 2013) A lot on his plate. The New Indian Express. Retrieved on 4 January 2014. ^ Parotta Soori and Pandi sing a kuthu number in Paagan. Kolly Talk. 29 December 2011.